I think it takes a whole lot of will power to resist the temptation of good bargains. That’s why whenever I go shopping, especially grocery shopping, preparing a shopping list is always a good idea – for me anyway. When I saw 2 punnets of strawberries selling for $5, overpowered by my adrenaline instead of my shopping list, I gave in. My rationale is there’s no harm in storing more fruits in the fridge. After all I choose fruits over vegetables any day. When I got home, I’ve realised that I’ve gone overzealous with the purchase of strawberries. To avoid unnecessary wastage, I’ve kept some for straight consumption, freeze some (perfect for making smoothies & crumble later) and the rest for muffins. As it was a spontaneous baking, I have replaced buttermillk with yoghurt. I suspect because of the switch, the batter became slightly dry. So I have added about 2 tbsps of milk just before adding the chopped strawberries. 2. Grease a 12 hole (cup) muffin pan. 3. In a medium sized bowl, place eggs, butter, yoghurt and vanilla extract. Whisk to combine. 4. 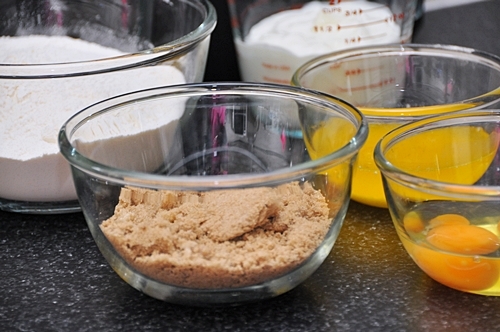 Sift in flour and brown sugar into the batter and stir until just combined. 5. Gently stir in chopped strawberries. 6. Divide mixture among holes of prepared pan. 7. Sprinkle topping (method below) over muffins before baking. 8. Bake muffins for about 20-25 minutes. Let the muffins stand in pan for 10 minutes before turning onto a wire rack. 1. Rub butter into flour and stir in sugar and almond flakes. 2. 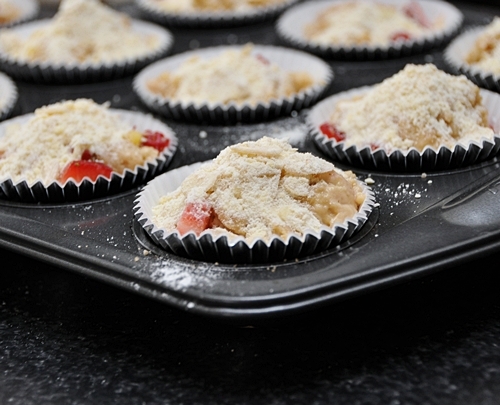 Sprinkle over muffins before baking. I can sense this muffins are scream at me: ” cook me and eat me! !” to me. Such tasty looking muffins. Emily’s recipe always amazed me every time. Thank you for sharing. You are too kind with your compliments. I’m glad that you like the recipe. Looking forward to your recipes too! 🙂 Take care. I’m the same way, I can’t resist a good “sale” at the grocery store. I love going grocery shopping!I could probably spend hours there just looking at the different products. Thanks for your comment. Take care. Great recipe. I like that you included almond for the topping. I like the idea for the crumb topping :]. Great recipe! Hey Emily, that’s a pretty muffin! Sounds good with the warm strawberry-Nice! The muffins are really good especially they just out of the oven and you can taste the syrupy strawberries inside the muffins. Yum. Sounds like I need to make another batch soon. hehe! Me too! impulsed sale got me every time when I saw the sign “on sale”. Seems like you love everything crunchy? I love it too! Is it getting too obvious that I love everything crunchy? 😛 Maybe this is my food OCD, lol. What a perfect way to use up all those strawberries! Looks delish!! Yes, definitely. Whenever you need a way to use up your strawberries, this recipe is highly recommended! Oh, the love the looks of these! 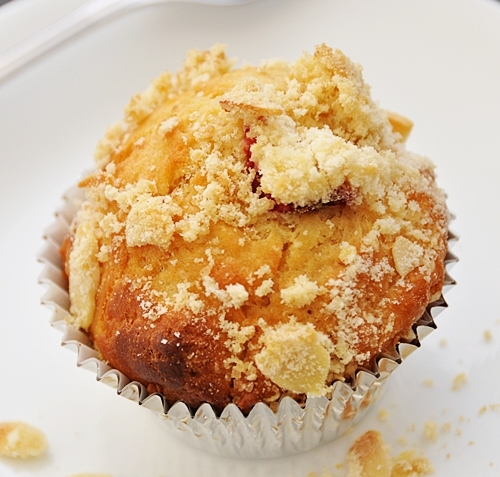 Muffins are so comforting! That’s a DEAL on strawberries. I would have loaded up, too. 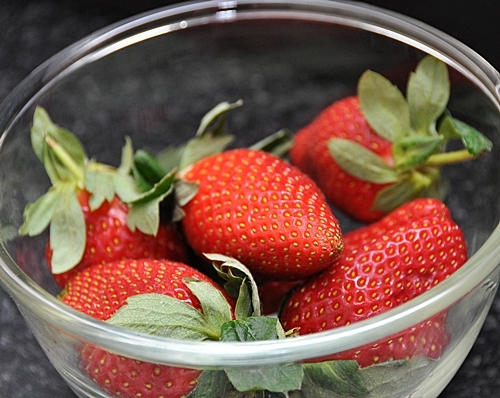 One thing great about strawberries is that they freeze easily and freeze well. 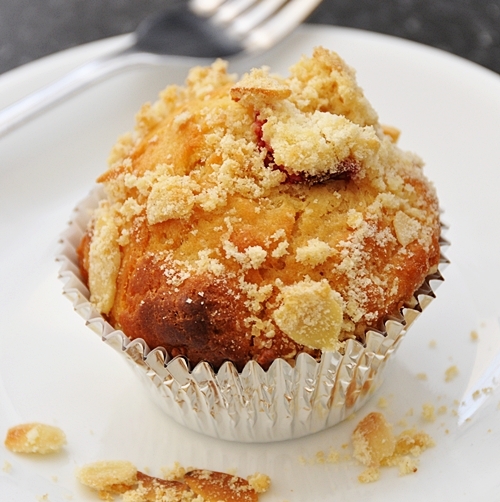 There is nothing better than a muffin with a crunch topping. Delicious! You know I am like you too, if I see a sale sign I buy things I do not need 🙂 but in this case I am happy as this is something I would love to make and with almonds on top, it is simply yummy.